With the touch of a button, this innovative countertop bar dispenser measures and pours your liquor for you. Entertaining is easy when your favorite cocktail ingredients flow like water. With the touch of a button, this innovative countertop bar dispenser measures and pours your liquor for you! Your compact bar shot dispenser system comes fully assembled and pre-plumbed and wired, for quick and easy installation. Store your supply bottles up to ten feet away, under a counter top or in a secure location and program each of the five buttons to automatically dispense a different pre-measured amount. Set your vodka button to stop after an ounce but let the rum keep flowing or let the gin pour freely but ration your scotch – it’s totally customizable and you’re the one calling the shots! Ideal for home bars, wet bars, boats, planes, RVs, limos and outdoor kitchens, this patented system uses five separate pumps to transport liquids from their bottles, through the faucet and into your glass. It’s like having five of your favorite spirits right on tap! Dispense any variety of juice, liquor, non-carbonated water, margarita mixes, and red or white wines. The unit comes with a 12v wiring harness to direct wire in boats, RV, limo, etc. The pump unit and supply bottles may be installed in a refrigerator, as the temperature will not effect the performance. a 3/4" opening is required to feed the lines to the faucet head. Please note that if desired, for liquor only, the pump unit can be installed in a freezer. Designed to serve non-carbonated and pulp-free beverages only. Carbonated beverages cannot be dispensed through the Sidebar System. I kept drooling over this item, till after months of seeing it every time I bought stuff for my home bar, I finally broke down & decided that Even though I didn't need it, I still had to have it. Now I love mine. It's fun, looks cool all lit up & guests are always impressed. It wasn't too difficult to install, but I am do-it-yourself kind of guy. I love that it can be set to pour specific amounts or free flowing. My only gripe is I would prefer that it come with more labels. Currently the gin button on mine dispenses everclear since I don't drink gin & it didn't come with a grain alcohol label. Don't judge me too harshly on the grain alcohol, I mainly use it to give weaker mixed drinks a little kick. 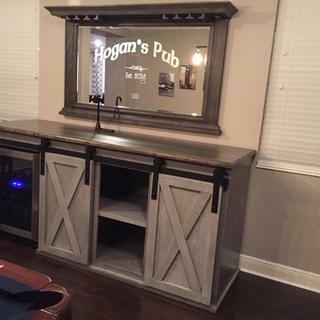 Functional and Fun addition to our in-home custom "Pub"
We love our SideBar addition to our custom in-home "Pub"! Can you install pump unit directly into a freezer? We checked with the manufacturer. Yes, the pump unit can be installed in a freezer (the temperature will not alter the performance). Obviously liquor only, frozen beverage lines will not work. Thank you Vicky. Can you send me the dimensions as well? The base measures 8" long x 2.25" deep. The spout is adjustable. It can be as low as 4” and a max height of 12”. how many drinks can you make per minute? would this work for a busy bar ? BEST ANSWER: I bought this for a home bar so I have no Idea how many drinks this would make per minute. but I would not recommend this for a busy bar for other reasons. Unless you are able to find large containers to pour your liqueur into to use as sources I believe that the frequency with witch you will need to swap bottles & the potential damage that the system can sustain from trying to trying to use it when a source liquid is depleted make this less than Ideal (The system uses the liquid it pours as a lubricant & the buyer is specifically warned not to let the pump be run dry or it will become damaged) This means that you will need to change the bottles before they are empty & then condense the partially filled bottles. I worked at a busy bar when I was much younger & I think for that purpose this would be more trouble than its worth. That being said I love mine & it is the envy of all my friends. I don't think I would recommend it for commercial use. It's not very fast. There are better machines for that type of application. Again, only 5 bottles, not carbonated, with no pulp or floaters. MY guess would be no,it pours fast, but only one person can use it at a time, you would need to refill it often. Please know that this unit is not designed for a high pace commercial setting, but instead for home use only. Can you please tell me how much the dispensing system pores as one ounce. UK uses 25ml as an ounce, America uses 30ml and Canada's ounce is 28.5ml. Can the dispensing amount be set? BEST ANSWER: My friend & I took a bottle of our favorite whisky & we used a small measuring cup & played with the adjustments till I got them all where I wanted them. It took a little patience & we took quite a few shots but we got them all dialed in. I could've used water to make the adjustments, but whats the fun in that? yes it can be set, however, we do not use this feature, we just hold down the button until we are satisfied with pour. This is a great item, we love it. Lines do periodically need to be cleaned. On the lowest setting (knobs on pump system) the system pours almost exacly 1 ounce shot glass. You can turn knobs and adjust from there. Have not set or measured at any other levels. YET. It is adjustable. It pours for a time and with a little experimentation you can get it to be whatever you want. Yes each bottle can be adjusted. on top of the unit there are 6 little screws that are used to adjust. Is there a seperate tube for each liquor all the way from the bottle to the dispenser? If not, how do you keep the liquors from mixing? BEST ANSWER: Yes. Each bottle has its own tube from bottle to end of dispenser. Each must be primed separately. Have had this dispenser for over a year and love it. The pressure is fantastic and it has never lost its prime. Very easy to install as well. Yes, there are 5 separate tubes for each bottle, the spout is also filled with 5 separate tubes so there is no mixing of liquors/liquids at all! Love mine, only thing I would like changed is more variety of labels. there is a seperate tube for each liquor.i didn't think they would all fit into the tube but it was really easy.having a blast using it at the outside bar.i don't have to transport bottles in and out. Yes, there are five separate plastic tubes. Each one goes to a different bottle of liquor and there is no mixing. Yes, there are 5 plastic tunes that go from each bottle all the way up to the tap. There are five tubes for five bottles. Each bottle gets its own tube. Does it matter which tube is attached to each type of liquor? BEST ANSWER: It does not. All of the tubes are the same, and you can switch/change the label stickers above the buttons to reflect the type of liquor. I've found it easier to just keep the types the same, so I don't have to switch the stickers every time I switch bottles. For example, line 1/the first button is always vodka... but I switch between brands. And I labeled the 5th spot as "mystery" so that I can put anything I want there without needing to change the labels up top! No. I try to keep the same type of liquor in individual tubes, but otherwise they are all identical. One for Rum, Tequila, Vodka, Whisky, Gin. Have you tried flavored liquors? can soda be ran through this system? BEST ANSWER: If I remember correctly the paperwork specifically states that carbonated beverages should not be run through the side bar or very syrupy liquids. Also the way the tubing runs to the source bottles you would not be able to retain the carbonation & your soda would likely go flat unless used very quickly. That being said my side bar is a very attractive feature of my personal home bar & one that is the envy of all my friends. Not sure! Mine is on my boat, which is put away for the season otherwise I would try it. I personally wouldn't think so because it pumps and has an impeller not air or gas pressure. Pumping would cause the carbonation to fuzz up. What I can tell you it works Great for liquor! The SideBar Beverage system is designed to dispense non-carbonated beverages only. Cheers! I would'nt because it would lose the carbonation if you kept it open in storage. How do you actually attach it to a counter top? Presume you need to place it permanently somewhere, and drill holes for the tubes to feed through? BEST ANSWER: There is a template provided with the pump for the 2 bigger holes and 2 small screw holes. If granite counter top I would get professional to drill because of close proximity of 2 larger holes. Fear of breaking. If regular malamute counter top be sure to tape around where you are going to drill to keep from breaking or cracking. Hope this helps. It comes with a template to drill the holes in the countertop to plumb the lines through, then it screws into the countertop. Very nice clean setup! Just like a regular faucet, you do have to drill through the countertop. Do the side bar liquor dispenser come in a single unit just for one bottle of liquor.? BEST ANSWER: No they do not. Unit has 5 separate lines with 5 separate pumps. It would be a little salty to buy this unit and only utilize only one line. It can handle up to 5 bottles. It has 5 separate tubes that go from the bottles to the end of the dispenser so the bottles never get contaminated. You can attach six bottles to it. BEST ANSWER: Yes, the Sidebar dispenser can be installed on a boat. Wet hands operating the dispenser shouldn't be an issue! Do not allow liquid to be spilled on the pump unit. Liquid entering the pump housing may damage the electronic circuitry and void the warranty. If liquid is accidentally spilled on the pump unit, carefully remove the fuse and allow the unit to completely dry. DO NOT USE FOR 48 HOURS. If the system is not used when wet, percentages are high that the unit has not been permanently damaged. Thanks Vicky. Gentlemen I was working with is Darrin. Any help you can give is greatly appreciated. the actual dispensing buttons and spout are water resistant... the pump and power supply would of course need to be protected from direct exposure to water. We love our system. Hope you have as much fun with yours as we do with ours. Go to sidebar(dot)com You will see more information on them. I think I remember one mounted in a boat on the advertisement. Stop wasting time and get one. They are AWESOME!! How hard is it to wire to the battery in an RV or boat? BEST ANSWER: Super easy. We tapped into the power wire from our stereo in a toy hauler. The 12volt power cord provided is pretty self explanatory. Find 12 volts and a ground, there ya go. Only improvement could be more screws to secure the unit in place for rough rides. Can one button be programmed to dispense varied volumes of different liquors? Effectively making one-touch mixed drinks, rather than pressing multiple buttons to incrementally dispense different liquors included in a cocktail. BEST ANSWER: Thank you for your question. Unfortunately, there's no way to operate the SideBar unit as you described. Can I buy replacement tubing 3/16 OD x 1/8 ID 50 feet long?